I got the call from my wife at 09:25, there was something very red and glamorous on the drive. I struggled to concentrate that morning at work (as a telecoms surveyor (the bills need paying!)) and at 12:00 headed for home in my Peugeot 108 loan car. 25 minutes later and I was staring at the Brilliant Red R8The wife had been spot on, it was very red and very glamorous. The R8 still uses a good old fashioned key so once in I inserted it into the ignition barrel, to the right of the steering wheel. She fired up instantly with a loud roar as if to announce to everyone in the vicinity, "Hey you, can you hear what I've just spent my £100,000 on, look. Over here, come on look!'" It is a good noise and very fitting for a car who's purpose is to entertain. Moments later I exited my drive and headed to work. Now, one potential issue is that the main road to work is shut so I would have to use the back roads. I felt quite cautious as it's a wide car with especially wide rear arches and a quick check reveals a total width (including mirrors) of 2,029mm whereby the little Pug 108 is just 1,615mm wide. The second worrying factor is the rather large expensive looking alloys and I don't want to grind them out on any potholes or ruts. I needn't have worried as forward visibility is excellent and the width seems to shrink when behind the wheel. I get to work in about the same time it took me to get home in the 108 as I took it fairly easy. On media days you have a short amount of time to fully test the cars out but this week I was going to start off quietly and soak in the detail and mannerisms of the car. Also, a temperamental, mid-engined supercar only takes a split second for you to get an input wrong and it'll spin you into hedge or oncoming car so I just revelled in the noise from the high-revving V8 for the journey. As I was parking, on full lock, into a free space the front diff complained as the front wheels rotated at different speeds. This is down to the R8's permanent all wheel drive chassis, so the front receives 30% of the power at all times. A tight front diff is great for traction and handling but it doesn't like being strained at full lock. On the journey home I took it easy again, used a little more revs on the straights but still respected the power and balance for the moment, there were another 6 days to enjoy and experiment. By the time I arrived home it was dark, the auto lights had already switched themselves on in the journey and I mustn't have noticed. As I entered my drive I crept up the raised pavement just in case the low front end was going to catch on the gradient but there was silence from the undercarriage and a sigh of relief from me. As I exited the car on my drive both front and rear lights stayed on to show me in. 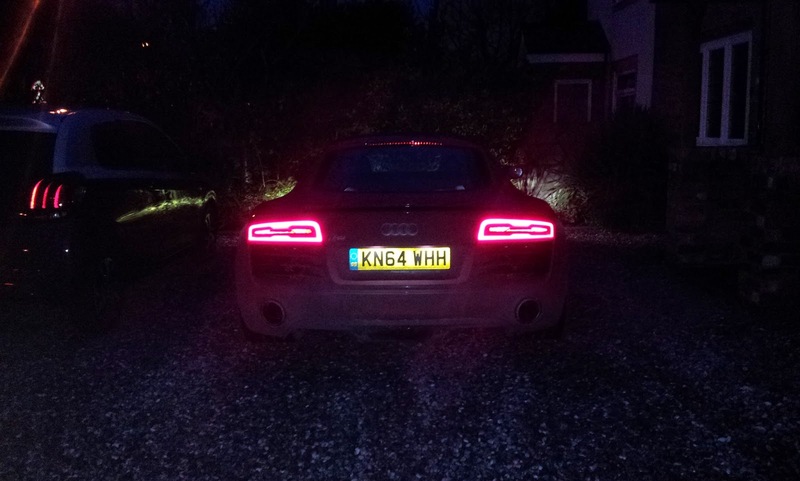 The rear lights look particularly handsome in the dark with an attractive pattern of warm red LED's. The first day has proven to be both exciting and uneventful, the R8 was a joy to drive but took everything in its stride. 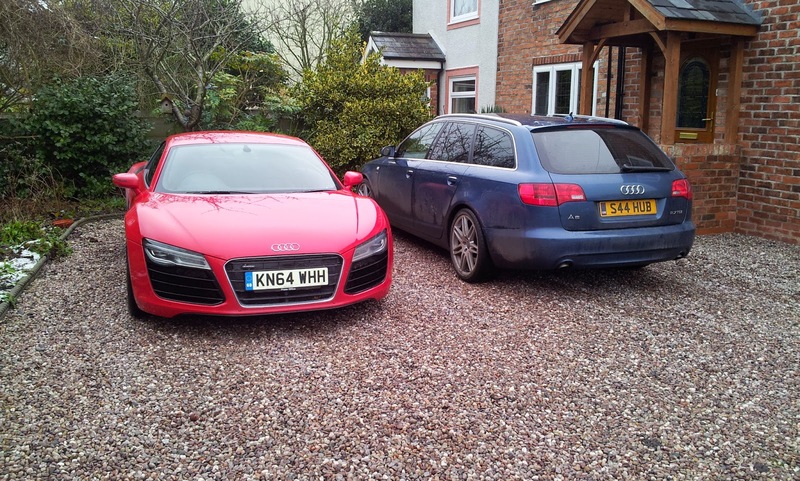 I left the house at 07:30 and was greeted with a crisply frosted R8. I blipped the car open, lifted the handle and the door opened easily with no drama from frosted up door seals. I started the engine to get some heat into the car and defrost the glass and cringed as all 8 cylinders try to wake the neighbours with their harmonious cold start bark. I am sure the exhaust flaps are open when the car starts, which is more evident on cold starts when the revs are higher. It soon warms up and a credit card takes the excess off the windscreen and side windows. I attempted to get through the closed road today as the roads are a little wider and my wife informed me it was actually closed further up, just past my turn off. She was right (as always) and I was a little more comfortable on these more generous roads. 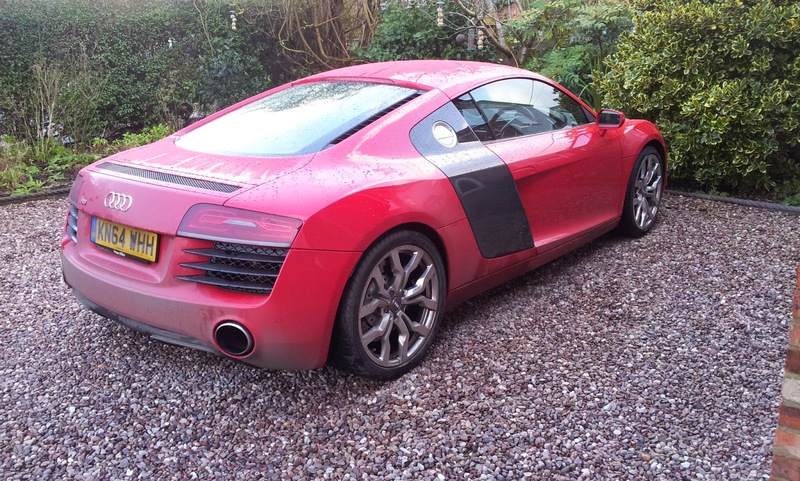 A quick check on the temperature revealed it was minus 3 outside so I didn't take the R8 past half throttle. Even half throttle is fast though and makes such a glorious sound I'm not left wanting for a hifi. The car soon warmed up inside so no skimping on the heater install here despite the heater pipes being further away from the engine than in front engined car. The heated seats take a little longer to warm than in my TT but then again I haven't driven a car with better heated seats than a Mk1 TT. I experimented with the paddles more today and found after 20 minutes I was starting to get the hang of them. In a manual car it is intuitive when you need to change gear but in paddleshift I found it quite alien. This week I promised myself I would be a fluent paddleshifter. After a fairly uneventful commute of some 15 miles the R8 behaved impeccably - the usual Audi switchgear and controls proven in other models worked faultlessly and its road manners are well controlled, unless you drive like a hooligan. Funnily enough at work more of my colleagues know my name (I only started 2 weeks ago). I think the R8 is the talk of the office. One of my colleagues has a Mk2 TT in red and came to talk to me about his dream car, that I happened to be driving today. I offered to take him for a spin so at lunch we headed off out. We just drove a few miles, running up through the gears using most of the revs, but the noise of the V8 constantly revving so highly just behind us impressed him. 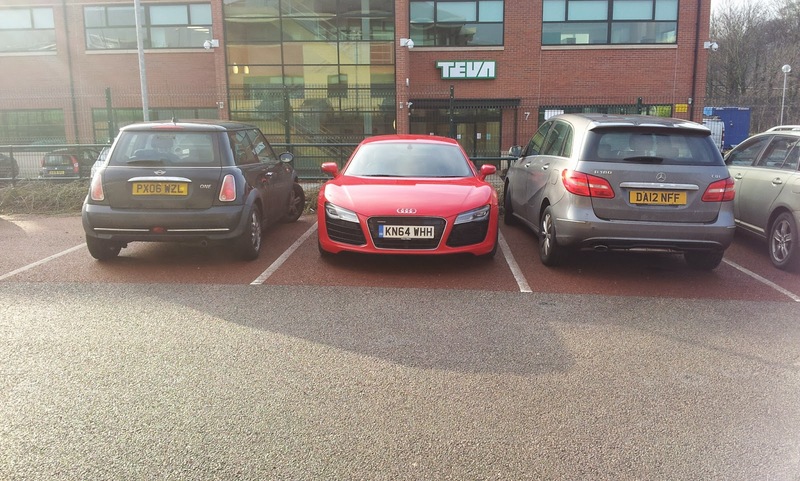 The interior was instantly recognisable to him, as a current Audi owner. Audi are renowned for making high quality interiors so when your supercar comes with an Audi interior then that's a good thing isn't it? Back at work I parked up and we admired the engine bay through the rear screen. I think he's gone from wanting to needing an R8. The commute home is made tedious by being stuck behind a horse lorry without any safe overtaking opportunities. After about 8 miles the driver finally feel guilty holding me up and so pulls over at the side of the road. Two clicks down on the left paddle puts me in second and the R8 flies off quickly and cleanly. The four wheel drive traction makes the R8 the perfect winter supercar and the all-weather tyres, despite being 295 section at the rear, don't tramline or lose grip easily on damp and icy roads. Tuesday night is pub night and it's my turn to drive but as there are four of us the R8 was rendered as impractical for pub duties. I considered ferrying friends one at a time to the pub but resisted as the only parking is on the street and didn't want to return to find it only had 1 mirror. The temperature is a little warmer today at 2 degrees but a light rain had made the roads greasy. My commute took a different route today as the workmen repairing the A559 must still have been tucking into bacon butties when I hit it so it remained open for me to get to the M56. After a short hop through some sweeping S-bends and through a sleepy village (sorry residents of Lower Stretton I forgot to turn off the blipping Sport button) I entered the M56 roundabout and took the slip-road down to the motorway. As I tried to enter the M56 from the slip road a jealous male BMW 3-Series driver refused to let me in so I dropped back and a slipped in ahead of a nice lady in a Fiesta, probably mesmerised by the R8's Knight Rider style sweeping indicators. Sat in the inside lane cocooned in the R8’s low slung, insulated cabin I found myself watching the traffic in the outside drive literally metres away from each other in some bid to make their journey shorter, but instead just creating a pile-up ready to happen. I didn’t feel the the need to change lanes towards the stunt drivers in the outside lane as the pace in all 3 lanes was similar but less traffic in lane 1 meant it was more relaxing and ultimately safer. On the motorway the R8 was perfectly calm, a car designed to be capable of 188mph it is rock solid at a steady 50mph and with sport mode off and the gearbox in auto everything was tranquil. After just the one junction I head off onto the local roads near work and noticed after the relaxing motorway hop that 30mph on rough roads made the R8 feel a little fidgety. The ride seemed harsher that morning after the exemplary behaviour on the motorway. There were more cars in the work's car park so I had to squeeze into a normal parking space. My first attempt was slightly askew but the R8's width amplified the angle and so I had to straighten up and do it again. At lunch another colleague wanted a ride in the R8, this time just to the sandwich shop but even that short distance was enough to shock - passengers can't believe the noise that comes from the engine just behind the cabin and even after 3 days the novelty doesn't wear off. The commute was again on the motorway although much faster due to less traffic with the hop from lanes 1 to 3 beautifully calm with no evidence of any body roll. A short distance to the next junction and down toward the esses again. This time the roads are a little drier enabling me to push on little more, the rearward weight bias evident here despite a low centre of gravity and wide stance. In the dark I didn't push on too hard as visibility is reduced but the R8 is in its comfort zone at legal speeds despite the quick direction changes. That got my heart racing, partly due to the excitement of driving a supercar over some enjoyable roads but also the potential for any damage that could be caused when driving on dark, damp roads with tight, blind corners and with wildlife lurking in hedgerows. As I settled to watch television that night I watched a re-run of Top Gear where Jeremy was testing the B7 Audi RS4 and saying that it may have one of the best engines ever made. It is the same aluminium engine that is fitted to the V8 R8 but in the R8 it boasts a dry sump for a lower centre of gravity and a little tuning for an additional 10bhp. I would agree with Jeremy, but in the R8 it is even better.